It is told from the Ramayana that Indrajit, Ravana's son, rained poison arrows upon Rama and Lakshmana. So overwhelming was this attack, that the two brothers suffered many wounds. "I shall send both of you to the house of death," cried Indrajit. Of course, in the Ramayana, it is taught that by the dark magic of Indrajit the serpents who were the sons of Kadru were transformed into arrows used specifically against Ram and Lakshman who were bound by these snake arrows, and it was Garuda who came and the arrows fled and Garuda held in embrace Ram. But in these battles, and in many others, and in the histories of sacred text, we read of powerful poison arrows, powerful healing herbs, glowing plants and trees. Do such things exist? Of course they do. Wonders are found in India. If we start with poison arrows, we know of examples in many parts of the world, and in the annals of India and across the ancient battlefields of Hindu military history, poison arrows have a long history. What was the poison on these arrows? In the Himalayas is found a form of monksbane called Aconitum luridum, which from the roots is virulent in poisonous quality, and which is used to produce Warfarin which is an anticoagulant. In Nepal is found a form of the same called Aconitum ferox, the roots of which are used to make the poison they call bikh, bish, or nabee. And bikh is also made from yet another variety of the same called Aconitum palmatum. It belongs to the buttercup family, different species of Aconitum, sometimes it Is called Blue Aconite, but there are Sanskrit and Hindi names for this poison which from the roots of the Aconiite is applied to the arrows and darts of armies. Aconite, atis, ativish (Nepali, "very poisonous"), ativisha (Sanskrit, "poison"), bachnag (Persian), bachnag (Hindi), bikh, bis, bis-h, bish (Arabic), black aconite, blue aconite, bong-nag, bong nga, gsang-dzim, Himalayan monkshood, Indian aconite, jadwar, kalakuta, mithavis (Hindi), monk’s hood, nang-dzim, nilo bikh, phyi-dzim, singya, sman-chen (Tibetan, "great medicine"), valsanabhi (Malay), vasanavi (Tamil), vatsamabhah (Sanskrit), vatsanabha, vatsanabhi (Malayalam), visha (Sanskrit, "poison"), woltbane. Blue aconite is found in Nepal, Kashmir (northern India), Garhwal, Sikkim, and Bhutan at altitudes of 2,000 to 3,000 meters (Manandhar 1980,7*). It is a typical Himalayan plant and has even been observed growing at 3,600 meters (Polunin and Stainton 1985,5*). It is said to grow at altitudes as high as 4,500 meters (Pabst 1887, 7*). Vedic and later Sanskrit texts indicate that the root of this Aconitum species was already being used as an arrow poison in ancient India in early times (cf. Aconitum spp.). In contrast to their original use, these poison arrows were used not in the hunt but in warfare (Bisset and Mazars 1984, 19). In the Shushrutasamhita, the Ayurvedic writings of Shushruta (ca. 300 C.E. ), Aconitum ferox is referred to as "vatsanabha." We know also at one point Lakshman was wounded by battle and in a death-like condition, and our beloved Lord Hanuman went to the Himalayas to find the herb to save them. Many others were struck down in a coma-like state, but the circumstances varied, in one case a weapon required one cure, yet another required a different cure. And it was not only poison arrows used in the battlefield of the Ramayana, but other more powerful ones. It is said Hanuman went to Dronagiri (Dunagiri, Mahodaya) in the Himalayas by the Valley of Flowers, to find the cure. One cure was the herb that is called Sanjeevani. Today Dunagiri is identified as located in the state of Uttarakhand in India where six small villages are found in the region located at a height of 2,400 meters or 8,000 feet above sea level. There is a Devi temple there known as Dunagiri Devi. Dunagiri proper itself is 2,290 m in the Himalaya, with a mountain that rises up to heights of 7,066 m one of the high peaks of the Garhwal Himalayas. From very early times places such Drongiri (Dunagiri), Badrinath, Kedarnath have been known as Soul of Gods (Devatma Himalaya) since these places are also the meditation spots (asanpeeth and sadhna-sthali) of many realized souls. Dunagiri or Drongiri is counted amongst one of the seven Kulparvats of the Purans. Jim Corbett Park is within driving distance. In the Valmiki version, four cures were sought and obtained from plants or herbs. One was to cure those stricken down by the arrows, called Vishalyakarini, "arrow remover". When struck with Aconite Monkshood of the Himalaya, the respiration slows and blood pressure synchronously falls to within 30-40 beats per minute, you can be partially alive but coma like but death will eventually come by asphyxiation. What is the cure for vatsanabha Aconite? One antidote is atropine. Sometimes called Kanakasava. Oddly the herbs which contain the atropine antidote to the arrow poisoned by Aconite are from the Solanaceae family and which if taken in large enough doses are also poisonous, be it Deadly Nightshade (Atropa belladonna) and other Belladonna family, Jimson Weed (Datura stramonium), Mandrake (Mandragora officinarum) and other plants of the family Solanaceae. Atropine comes from Indian Belladonna, Atropa acuminata found In the Western Himalayas from Kashmir at the altitude of 1800 to 3600 m to Himachal Pradesh up to 2500 m.
And there is Anisodus luridus, the flowering plant or herb found in the Himalaya Mountains of India, Nepal, Bhutan and China. It is a solanaceae, containing atropine and hyoscyamine (Siebert, 1890). Anisodus family is a genus of flowering plant in the family Solanaceae - there are six such plants all of the Nightshade family. The flower of Anisous Luridus is a pale yellowish green. Some references in scientific literature list Selaginella bryopteris, but actually no one is positive. And this plant is not prominent in the Himalayans. Today what is called Sanjeevani is a fern, and as a fern does not match the description in the Ramayana. Sanjeevani is supposed to have the characteristic of bioluminescence or emitting light. 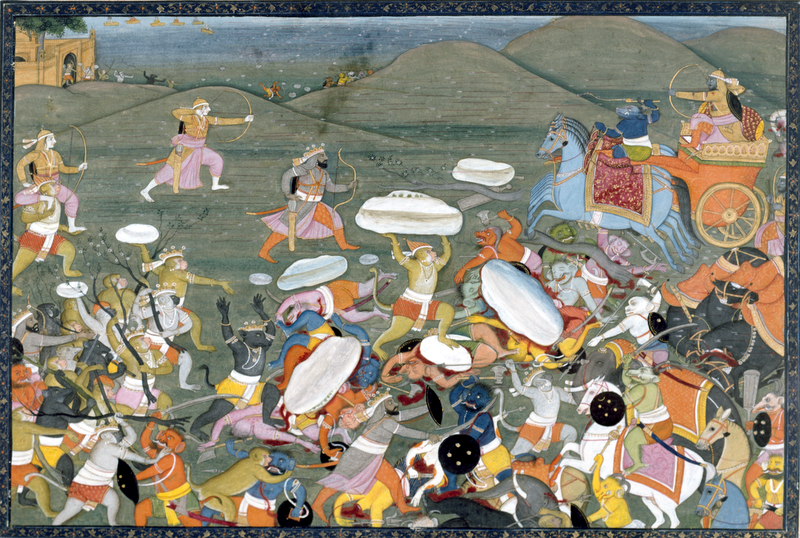 In the Valmiki Ramayana, Indrajeet strikes down most of the Devas and Ram's army with arrows. Jambavan tells Hanuman, "O Hanuman you are the only one who can save the lives of the two brothers, as well as the lives of all the vanaras. Go immediately to the golden peak on the mountain called Himavan which is rich in herbs and bring back the four magic herbs. The one called Mritasanjivi (Mrithasanjeevani, Sanjeevani, "restores life") will bring the dead back to life, and Ishalyakarani (Vishalyakarini, "arrow remover") will heal all wounds and the other two (Sandhanakarani, "frame restorer", Savarnyakarani, "color restorer") will reset fractured bones and give a glow to the skin". In the Adhyatma Ramayan, Lakshman indirectly is struck by Ravan when Lakshman tries to protect Vibhishana. 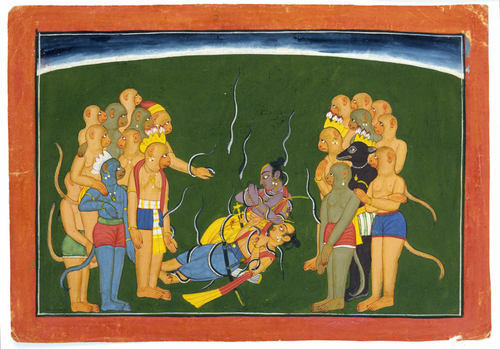 Falling into unconsciousness, Lakshman is saved by Hanuman who obtains the Sanjeevani Booti healing herb to revive the stricken Lakshman. In the Tulsidas revelation Ramcharitmanas, Indrajeet injures Lakshman with a powerful weapon and he falls unconscious. Vibhishan tells Hanuman to bring the doctor Susena from Lanka. Susena tells Hanuman to bring the Sanjeevani from the Himalayas. In chemiluminescence, light energy is released by a chemical reaction. Fireflies are an example of this. An example of such chemical reaction is when the chemicals luciferin and luciferase work together. The luciferin reacts with oxygen to create light. The luciferase acts as a catalyst to speed up the reaction, the chemical reaction can occur either inside or outside a cell. In bacteria, the expression of genes related to bioluminescence is controlled by an operon called the Lux operon. Fungi in plants can cause bioluminescence and in humid areas with tropical rain and decaying material such as logs, here would be the typical habitat for such fungi which use luminescence for detoxification of free radicals to attract insects with the light because the insects help to disperse the fungal spores, thus a symbiotic like relationship like bees, flowers and honey. Luminescent fungi contain NADH dependent reductant to reduce luciferin but luciferase is absent. Here, many believe, is the key to discovering the actual Sanjeevani herb - it can glow. There are orchids that have bioluminescence, there are woods which decay and glow. Those that do are likely dependent on fungi that causes this reaction. So properly speaking, a combination of a plant with fungi is the answer, perhaps the type of plant with a woody stem or stock that decays or becomes habitat for such fungi. Or it could even be tiny organisms which have this property living on the plant naturally, we know of tiny marine organisms called dinoflagellates in the sea which do so, similar organisms which might live on a particular wet skinned plant could be the case. Perhaps it is this fungi itself that has healing properties, or a combination of the herb and the fungi that is the potion, or organism on the plant. There is also a light emitting alga known as Pyrocystis fusiformis which typically do not occur in high enough concentration to get a bright light but when the conditions are right with excess nutrients and sun an algoccupancyopulations explodes and you have enough to get a good glow. So what is the potent that is the cure? The plant? Something living or growing on the plant? Or both together? Or when something visits the plant when just the right circumstances align themselves, and it all “comes together”? I think this luminosity is key in the discovery and identification of the true Sangeevani Booti. Just a few months back in February of this year 2013, Indian scientists in Kerala discovered carnivorous plants which give off a glow or light. The research team discovered blue fluorescent emissions from the plants' "capture spots" when tested in ultraviolet (UV) light. Admittedly, only insects and small animals can see this glow from these plants – but nevertheless, what is not seen today may be seen clearly tomorrow if just the right factors come together. In Colonial times in America, the colonists would not eat tomatoes, which originated in Peru, because they believed it was poisonous. Overtime they realized and accepted it was eatable and good for cooking recipes. Sometimes the populace is unaware of all the plant, fruit and vegetable life around them which has immense value. I believe that the Sanjeevani Herb or plant is there, in India. I believe what the world today calls “Sanjeevani” is not the same plant in the Valmiki Ramayana. And I suspect the key to discovery of Sanjeevani is this question of its luminosity. This is a vital marker to finding the actual Sanjeevani Booti. I suspect there are rishis, munis, yogis, savants, mystics of Hinduism who know precisely which plant is Sanjeevani, and where it is to be found. Such yogis and renunciates and mendicants wander the forests, jungles and high mountains of India and the Himalayas. Sometimes they come and gather at such places as Varanasi. Sometimes they may even give Sanjeevani to some, very few, for different reasons. But the world does not know. And why would the world not know? Perhaps the world isn’t ready to know, not at this time. Even if I knew, I am not sure I would even tell anyone. We may think our little tomato garden in our back yard is wonderful. Perhaps it is. Once we were afraid to even eat tomatoes. All around us are amazing things. But wonderful things are even more than amazing. There are wonders in India. In your entire life, there will not be enough time to discover all the wonders. But at least you know where to start to look. Maybe someday people would identify some of these and attribute it properly to our texts. A coincidence that struck me was that most (if not all) poisonous vipers share an arrowlike head. Even more, the land with more poisonous snakes than anywhere else - Australia sounds lie Astralaya (Astra+aalaya = storehouse of weapons). i must say your article is very fascinating, very informative indeed, regarding this topic, i had some doubts i hope you can answer my queries. 1. all these facts and data that you have used about sanjeevani booti in your article, which ancient text mentions about them (in specific) ? 2. their are two different stories in this regard, one by valmiki and one by tulsidas, which one is more relevant to you ? i hope to see a positive reply from you. very beautiful post .In homeopathy we use 'AConite' which is useful in any infection in the initial stages . Once one tribal told me that there is a plant in the Nilagiris which emits light . It could be a different plant , but he was telling that it has medicinal properties . The phenomenon of glowing plants is at least theoretically possible from a scientific perspective. Bioluminescence is a process by which living species generate light using chemical reactions that take place within their bodies. Ancient people most likely attributed healing abilities to this plant because the light it gives off enhances photosynthesis in the nearby plants. This would have given the appearance that the Sanjeevani had magical life-giving abilities. My sincerest apologies for double-posting. It is customary to cite the doctrine of the Yuga cycle to explain the decay of morality over time, but our own shastras tell a different story. During the Mahabharata, the use of poison arrows was explicitly prohibited by the rules of the conflict. Here in the Ramayana is an incident where rules of behavior that are established during later yugas are broken by people living in a supposedly more pure time.